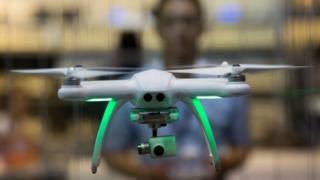 A Hong Kong man has been arrested in China for planning to use a drone to disrupt a high level Chinese visit to Hong Kong, Chinese state media said. The 56-year-old, named Guo, was arrested in Shenzhen with four others, Xinhua said, adding that he had links to Hong Kong pro-democracy activists. Security is high ahead of a visit on Tuesday by the third-highest ranked member of China’s Communist party. It comes amid concerns in Hong Kong over interference by Beijing. According to Xinhua, a Hong Kong pro-democracy activist “had told Mr Guo to buy a drone” that would be used for “disruptive activities” during a high-level visit. Shenzhen police said the arrests were made on 6 May, South China Morning Post reported. Zhang Dejiang, chairman of the National People’s Congress and responsible for Hong Kong affairs, will be in Hong Kong this week meeting with business leaders and members of parliament. He is the most senior member of China’s Communist party to visit Hong Kong since pro-democracy protests brought the city to a standstill in 2014 for months. Hong Kong, a self governing special region is given freedoms not seen on the mainland under the “one country, two systems” agreement made before it was handed back to China by Britain in 1997.